How many events do you really, really look forward to each year? Birthdays, anniversaries, holidays, trade shows. Whoa, back up there. How did that last one make the list? 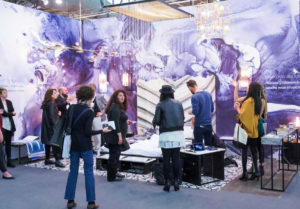 For design insiders, the Architectural Digest Design Show is a highlight of the year. 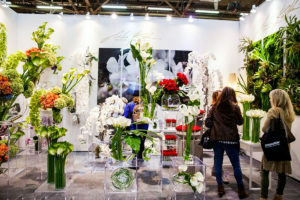 The show, open only to the design trade on March 22 and then to the public on March 23-25, will feature more than 400 influential companies showcasing the latest in home fashion. And it’s practically in our backyard, at Piers 92 & 94 in New York City. General admission tickets March 23-25 are $30 online, $40 at the door. 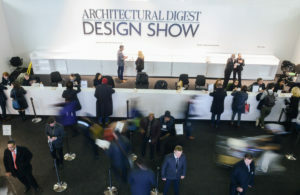 The buzz at the entry to the Architectural Digest Design Show. Photo by Matthew Carasella. My colleagues and I from Design NJ are proud to be a media partner of the show. We look forward catching up with our exhibitor friends and getting a first-hand look at their new products, from furniture, lighting and accessories to kitchen, bath and more, from independent makers to established manufacturers. Our visits to the show always inspire us in our selection of products to feature in upcoming issues of Design NJ. Some of the exhibit booths at the show are as creative as the products inside. We especially love the MADE section, featuring handcrafted, often limited-edition or one-of-a-kind furnishings, accessories and art. And we can’t wait to see four specially curated installations this year: The AD Apartment (designed by renowned Drake/Anderson, anchored by rich amethyst walls and sponsored by Monogram), an entryway exhibit of a work titled Unbound by artist Joseph La Piana and sponsored by JennAir, Designer Focus (with four distinctive vignettes, including one by Jersey City-based Joshua David Home) and Associative Design (featuring works by top Portuguese designers). Real or faux? You’ll have a chance to reach out and touch at the show. If that’s not enough, the seminar program includes “The Royal Families of Design,” featuring representatives of three of the most prominent design families of the 21st century — Aerin Lauder, Alexa Hampton and India Hicks — sharing the stage for the first time. Two other seminars will focus on color, one with designers Joe Nahem, Jason Oliver Nixon and John Loecke, the other with designers Genevieve Gorder, Charles Pavarini III and Björn Björnsson. Top design names such as Ellie Cullman, Victoria Hagan, Jeffrey Bilhuber and Douglas Friedman will offer advice also.